We were among the first to get our hands on Keiji Inafune's / Inti Creates' new 3DS side-scrolling action game, Azure Striker: Gunvolt here at BitSummit 2014 in Kyoto, Japan. We now have the first details on the game's story, world, and characters, straight from the developers. In the near future, a new type of psychic power has evolved, and those with the powere were initially feared. A large conblomerate known as the Sumeragi Group took it upon themselves to round up those that posess these powers to bring order to the world. But it turns out that their shelter was actually a concentration camp for those with the powers, and that experiments were being conducted daily on them. A group called Feather was formed after learning of these concentration camps, and they work together as a human rights organization to protect the psychics. 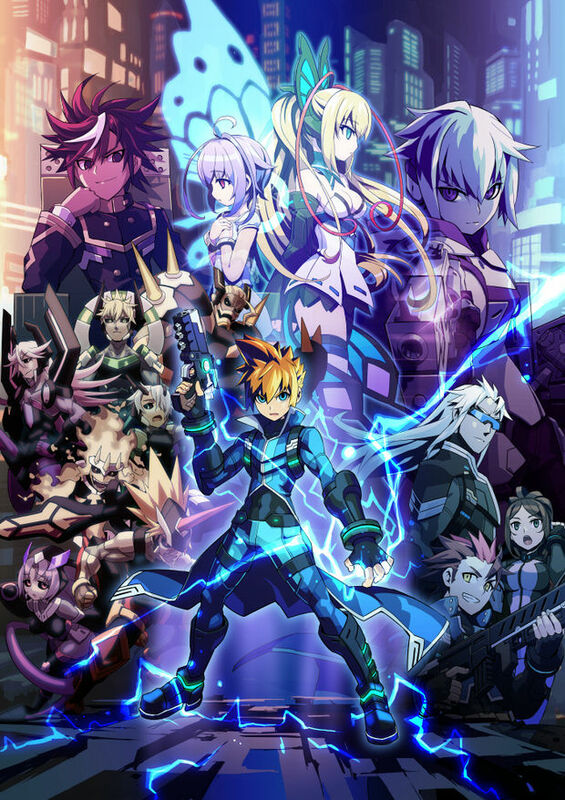 One member of Feather, a 14-year-old boy named Gunvolt, sets out on his first mission to assisinate Lumen, a virtual pop star. 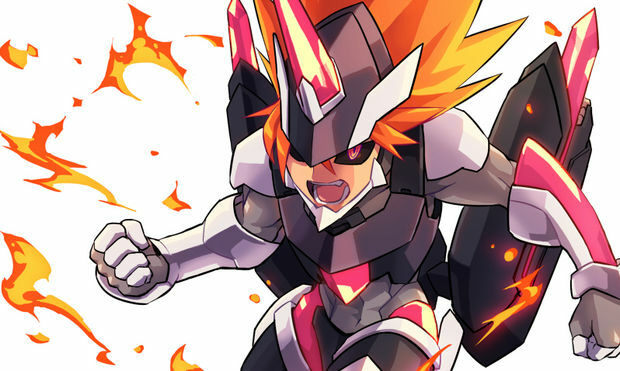 Gunvolt -- Gunvolt is a nickname -- his true name remains his secret. His power, Azure Striker, allows him to control lightning. 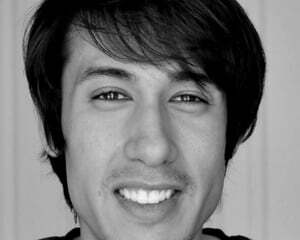 He starts out as a member of Feature, but he leaves when he meets a girl named Joule. 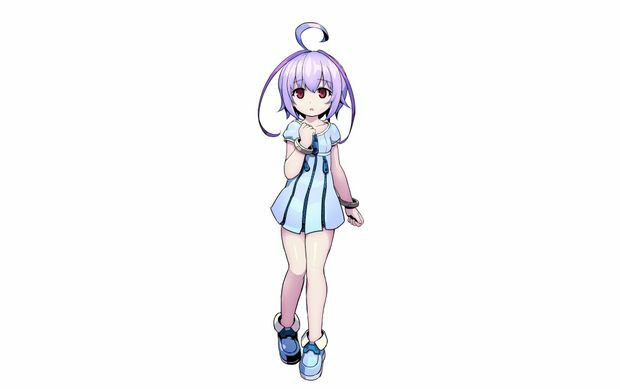 Joule -- Joule is a 13-year-old psychic created in a lab by the Sumeragi Group. Her power lets her enhance the power of other psychics through song. 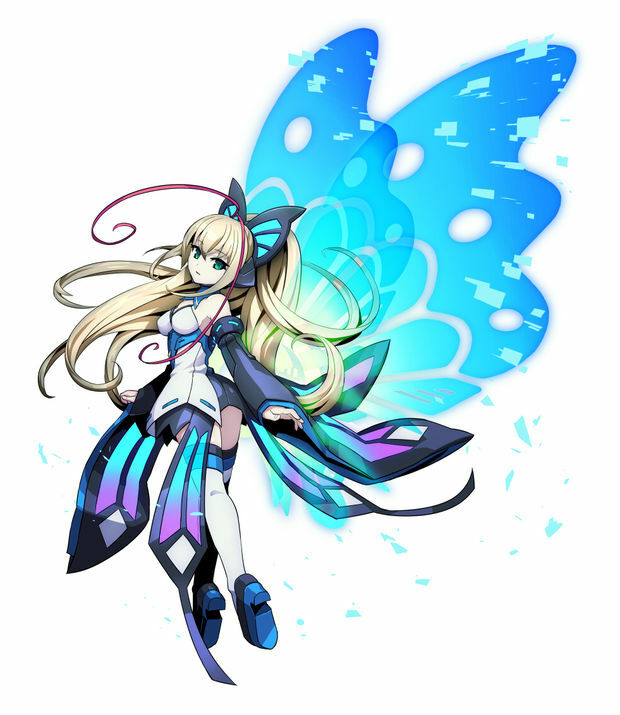 She is rescued by Gunvolt, and they begin living together. Lumen -- Lumen is the most famous pop star in the country. She's actually the avatar of Joule. The Sumeragi Group is using her as sonar to find other psychics to capture them. Lumen claims she only reflects the person Joule wants to be deep inside. 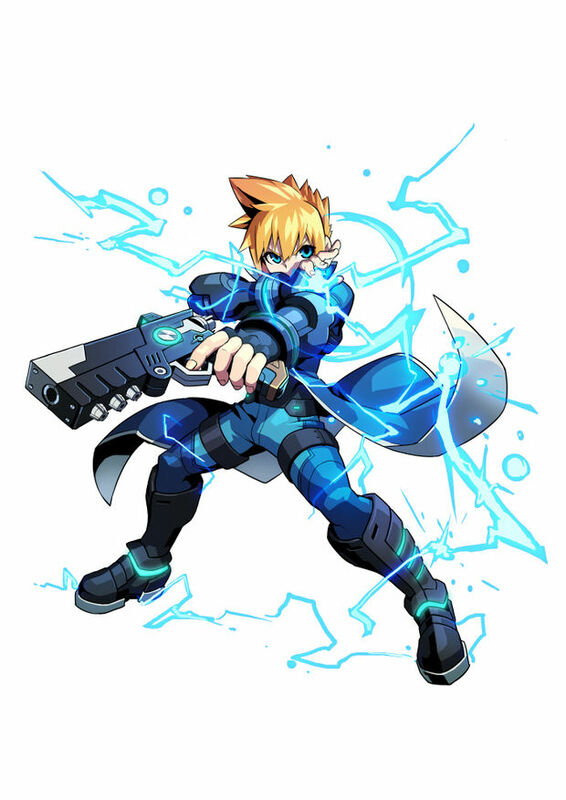 Conductor Gun -- Gunvolt has a rapid fire gun that doesn't do much damage. Holding down the fire button allows for continuous fire. 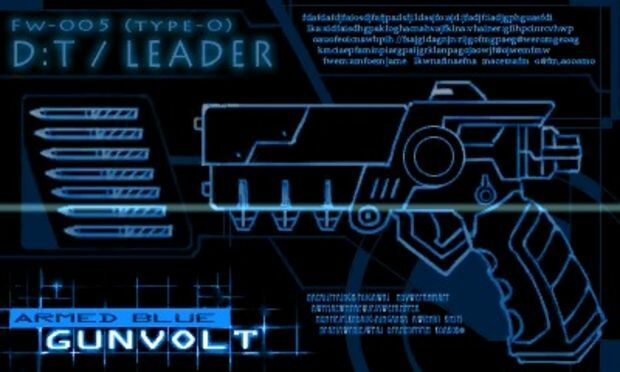 This gun can be used in conjunction with the lightning ability to lock onto targets to increase its damage power. 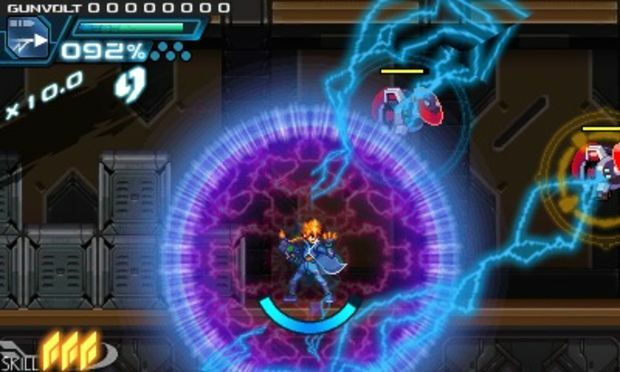 Lightning -- By activating lightning (by pressing R button), Gunvolt can generate a protective ring that works as a shield. It also does damage to any enemy that comes in contact with it -- they'll slowly lose their health while touching it. 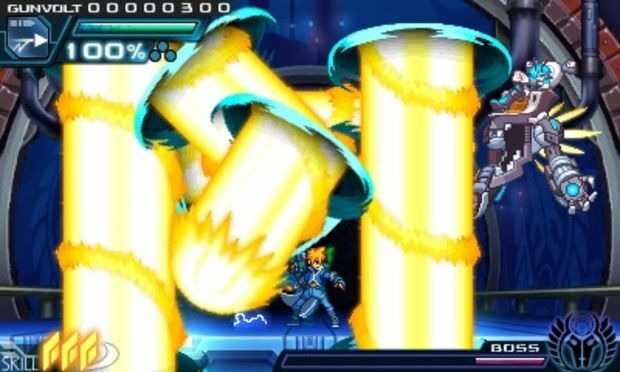 Offensively, lightning lets Gunvolt lock onto enemies to damage them, and that damage can be increased up to three times by continuing to hold down the R button. This ability can be aimed at several enemies, and this allows for attack chaining, which helps the player reach higher scores. Lightning also lets Gunvolt levitate, giving him a platforming advantage. 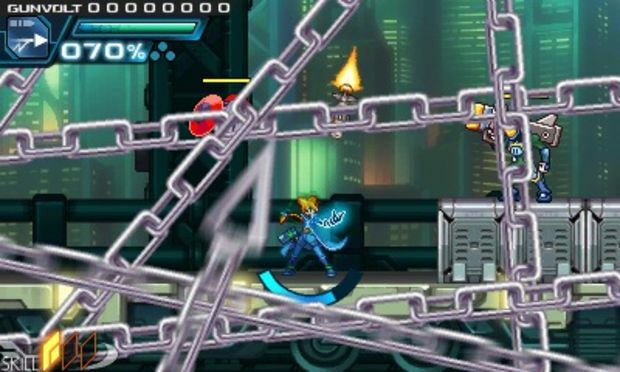 Instead of falling down pits, Gunvolt can ease down while shooting. He can also float upward, allowing him to get in more shots than he would with jump shooting. 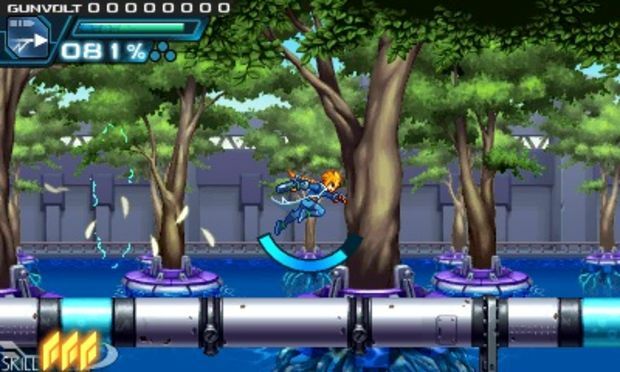 Gunvolt can jump and double-jump, as well as dash. Used together, he can perform mid-air dashes. Beyond these moves, he'll learn new ones as the game progresses. We only saw one of his special abilities: Voltic Chain. By tapping on a touch button on the 3DS bottom screen, this attack sends giant chains across the screen, and then he charges them with electricity to do damage to enemies. Daytona — Fire is Daytona’s psychic ability, and it allows him to create explosions. His slide and leap attacks make him difficult to dodge. Melac — Melac is able to create wormholes, and his attacks are unpredictable and hard to dodge. He is able to send an attack through one wormhole and have it come out another. His special attack lets him send laser beams through several wormholes at once.